That is a phenomenal photo! Many thanks. Beautiful capture, Mike. One of my favorite birds – with its soft breast color and wonderful mask! From my earliest childhood memories of Zorro and the Lone Ranger I have always had a thing for black masks like the one that the Cedar Waxwings sport. Nice shot of one of my favorites. They’re a very pretty bird. 🙂 I am rarely confident in photographing people and I think my worst nightmare as a photographer would be to photograph a wedding. Lots of pressure and lots of different people that you are trying to satisfy. I doubt there’s many who’d enjoy doing that job Mike! 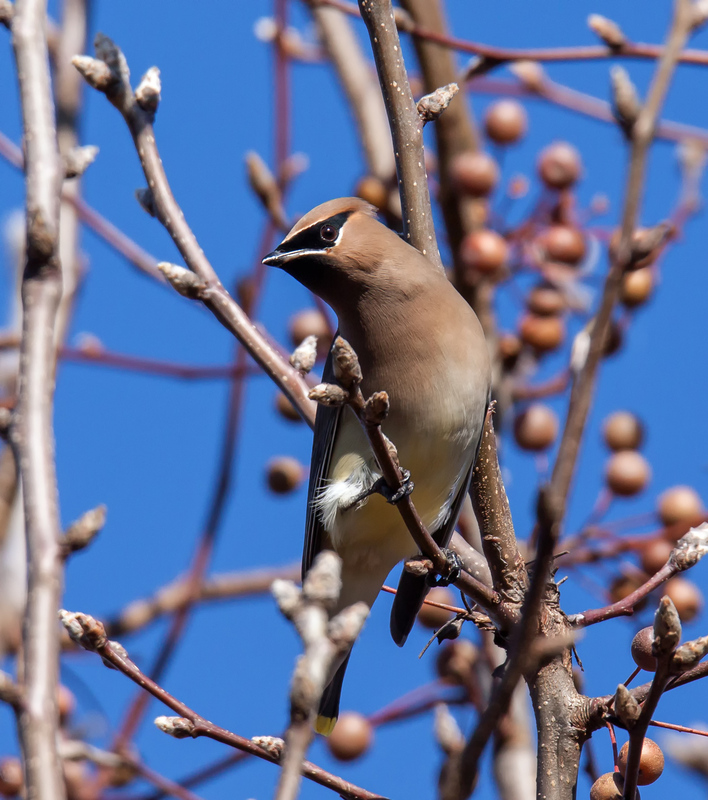 Great capture of the Cedar Waxwing against the blue sky, Mike! And always a pleasure when a bird turns in a pleasing way! Definitely have to take advantage of those situations because they don’t happen all of the time. Thanks, Ellen. This past Monday was one of the few days with warm sunshine and blue skies the past few months, it seems. Many of the other days with sunshine have been bitter cold and/or really windy. Hopefully you will get some more decent days. I’m less inclined as this winter approaches this year to get out there in the cold. Of course I may change my mind as the season wears on! on December 11, 2018 at 6:10 pm | Reply Molly D.
Always on of my favorites because I see it here in Batavia, Ohio so rarely! Cedar Waxwings have such a cool look to them–I too wish that I saw them more often. Of course, their rarity makes each encounter even more special.